Since we are having take-out tonight and I will not be cooking, I am discussing what I had for lunch instead. Going to my trusty freezer I find a container of celery soup. 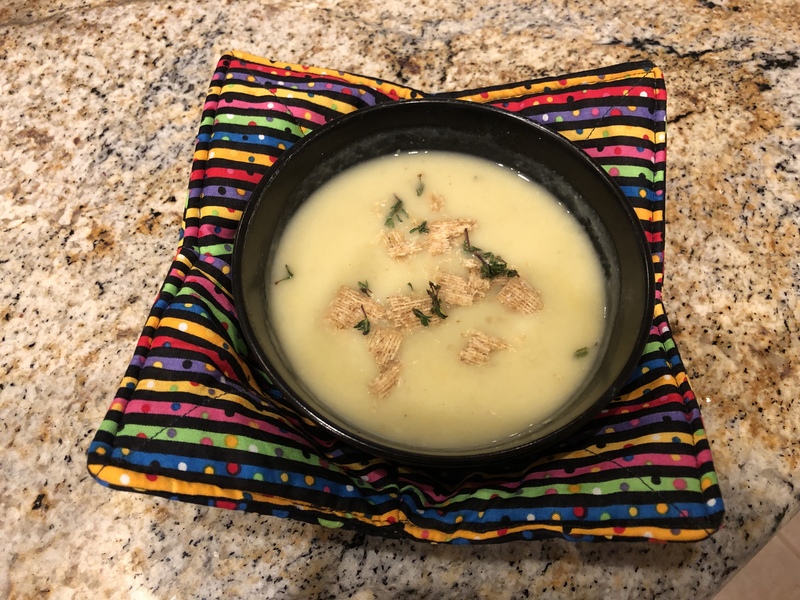 This recipe is so easy and makes quite a bit of soup, certainly enough for freezing leftovers. The soup comes out really creamy with a subtle celery flavor. It is low in calories and quite filling. Today I garnish the soup with fresh thyme and a crumbled Triscuit. Chop an onion, a whole head of celery, one waxy potato, and 2 cloves of garlic. Cook them in the two tablespoons of olive oil with seasoning until the onion is translucent. Add 3 cups of stock and simmer until the potatoes are cooked, about 10 minutes. Add 1/4 cup herbs (optional), and blend or food process until smooth. Adjust seasoning. Serve with a drizzle of olive oil and a celery leaf or herb garnish. Did you notice my new microwave bowl holder? One of my friends made it and gave it to me this week. Since it uses 100% cotton materials it is microwave safe. I snuggled my bowl in it and microwaved the soup for two minutes, stirring occasionally. No burnt fingers when I removed it from the microwave! This entry was posted in Easy, Vegan, Vegetables, Vegetarian and tagged Celery, soup. Bookmark the permalink.